Slip and falls can occur at almost any place and at almost any time. A patch of ice in a supermarket parking lot, an uneven sidewalk on a main street, or a poorly lit apartment stairwell are all common locations for a slip and fall to occur. However, regardless of the location, if you have been injured from a slip and fall, it is important to speak with an accident attorney in New Jersey. A slip and fall attorney will tell you that there are two main elements to any slip and fall claim: duty and notice. For a plaintiff to recover, a defendant must have breached some form of duty to the injured party. Duty mandates that a defendant exercise reasonable care in the inspection and maintenance of his property in order to avoid unnecessary injury to the public. In a minority of states, the duty a defendant owes a plaintiff depends on the status of the injured party. For example, if a plaintiff is a trespasser, some states hold that the defendant owes them no duty; conversely, if the injured plaintiff is deemed an invitee (someone who is on the property for business purposes such as buying or selling goods) the defendant owes the plaintiff a heightened standard of care which requires a reasonable inspection of the property to remove any foreseeable risks of harm. A majority of states, however don’t assess liability on a sliding scale and use notice as the primary indicator for establishing negligence. Slip & fall cases typically hinge on the issue of notice. Did a defendant recognize and have a reasonable opportunity to remedy foreseeable harms on his or her property? If the answer to this question is yes, then a defendant typically can be said to have been on notice of the dangerous condition on their property. An examination of the frequency of inspections and the common practices in a defendant’s field can often help assess whether or not the defendant should reasonably have been placed on notice. If a defendant participates in routine, sensible property management, that participation imputes upon the defendant the responsibility of identifying and remedying conditions that are likely to cause harm to someone on their property. Failing to inspect may also be deemed an act of negligence if the dangerous condition would have and could have been found by reasonable inspection. Property owners/occupiers cannot simply walk around with blinders on, thinking that they can escape liability by claiming that they simply didn’t know about the hazardous condition. Out of sight out of mind is no defense when it comes to ignoring dangerous conditions on one’s property. Did the property owner owe you a duty? Should he have been on notice that there was a dangerous condition on his property? These are often difficult questions to answer without consulting with a slip and fall attorney. 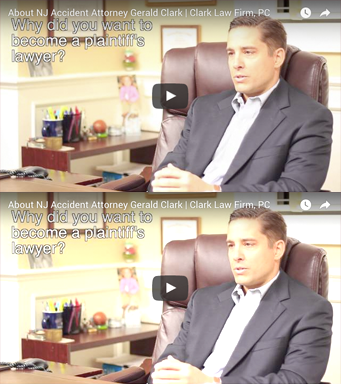 The Clark Law Firm, PC with offices in Belmar, Rutherford and Newark, New Jersey is here to help. If you have been injured as the result of a slip and fall, speak with one of our experienced accident attorneys today. One of the more common areas for a slip and fall injury is at the supermarket. Most of these incidents occur when a patron slips on a liquid or slick material on the floor, causing them to lose their footing. Serious injury such as broken legs, hips, or arms can result from these slip and fall incidents; brain damage and spinal chord injuries can occur as well. A high percentage of these fall down incidents occur because of the negligence of store owners: particularly in their failure to remedy spills causing slippery areas, sidewalk cracks, icy conditions, floor defects, raised carpets and areas made dangerous by poor lighting. These type of fall down injuries can occur almost anywhere: inside the store between the aisles, when entering or exiting the store, or in the store parking lot. Commonly, supermarket fall cases occur when products have fallen or spilled on to the floor. The question for your personal injury attorney then becomes: did the defendants have a reasonable amount of time to identify and remedy this dangerous condition before you became injured? This is typically an examination of whether defendants were placed on a form of notice known as “constructive notice.” A key piece of evidence in these cases is often the actual object that caused your fall. You need to retain this object and give it to your personal injury lawyer, even if it is a perishable item such as a piece of fruit or vegetable. If you failed to keep this piece evidence, your personal injury attorney will ask you for a detailed description of the item. If you or a loved one has been injured and needs an accident attorney in NJ, contact the slip and fall attorneys at the Clark Law Firm, PC. for a free consultation.